The ISC International Journal of Information Security (ISeCure) is a peer reviewed scholarly publication by Iranian Society of Cryptology. 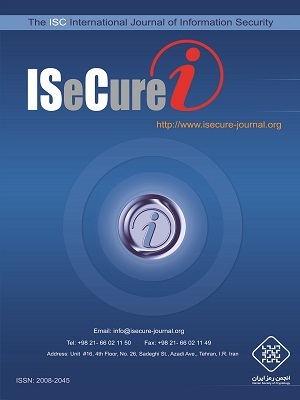 ISeCure is published biannually in print and online with full texts of articles made available for free on the website of the journal under ISeCure open access policy. ISeCure is devoted to publishing theoretical scholarship on a variety of topics related to information security. The intended audience of the journal is any person with an interest in information security from an academic perspective such as engineers, mathematicians and computer scientists. A partial list of topics for review by the journal can be found in the Aims and Scope section. Manuscript types for submission are research papers, review papers, case reports, short communications and letters to the editor. More information about the policies of the journal can be found on the About Journal and mostly in the Publication Ethics pages. To start a new submission, please first read the Guide for Authors page for detailed information about manuscript format, style and other requirements. Manuscript submission, refereeing and publishing are completely free of charge. New manuscripts should be submitted online by the corresponding author through the website after registration. Articles published in ISeCure Journal are indexed in the Emerging Sources Citation Index (ESCI) database of Web of Science/ISI.